Every little girl cringes at a parent holding out a hairbrush. Sprays and conditioners at the store contain questionable ingredients. Include your little one in this DIY recipe for homemade detangler spray and she'll let you brush the tangles out with ease. Having a girl changes everything. 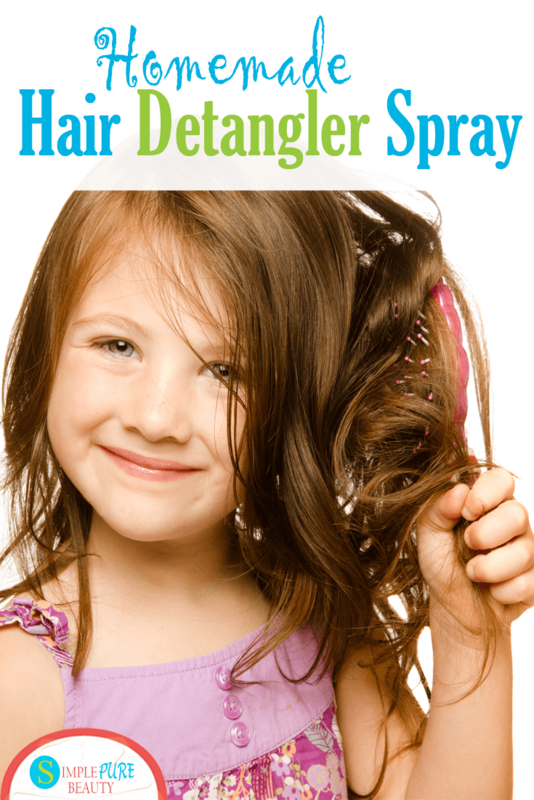 For many years I had 2 boys and never really needed something like homemade detangler spray. I would just wet down a few wild hairs and they were good to go. Along came my daughter. I had wished and prayed for a daughter for many years and when she was born she definitely made her presence known. I'm pretty sure she cried for a week straight. And she has never hesitated to make her feelings known since. Very loudly. But she is a blessing and a joy and life would be pretty boring without her. But when this girl wakes up in the morning or after a short car ride, her hair looks like a rats nest. Frizzy, matted and not very pretty. Hence, I find having homemade detangler spray on hand is necessary at times. Having a great detangling brush on hand, like this one, can really help as well. This recipe calls for Lavender and Tea Tree essential oils as well. Both are great for the scalp and hair. The recipe also calls for Lavender Mint conditioner, but whatever natural conditioner you have on hand will work as well. Apply detangler to hair as needed.